That was 1933. I would love to say that in 2005 I am finding the phrase a great source of inspiration and encouragement. But I’m not. I do fear fear. Most of us do. Fear is scary. That’s what makes it fear. I’d much rather arrange life so I never have to partake of the stuff. Oh, Great Bartender, give me a tall glass of the usual — easy on the risks, heavy on the familiar. Here is a short inventory of the various ways that I run, not walk, away from fear, semi-successfully convincing myself that I am not afraid: resisting a risk, resisting a rest, judging what I don’t understand, over-eating and drinking, pretending I’m not angry or hurt or scared and, on a more subtle level, purchasing platitudes that fit snugly over my ability to consider, and possibly even learn from, points of view other than my own. In the Webster’s Dictionary, Kalechstein edition, a platitude is defined as a sentence, often found on refrigerators, designed to shield humans from the raw vulnerability of life. Platitudes may contain some relative truth. Yet they are often held as absolutes, thereby becoming dogma. For example: God never gives you a challenge without also giving you the strength and means to overcome it. Mental institutions and graveyards are filled with people who would beg to differ. With my no-latitude attitude on platitudes, you would be correct in assuming my refrigerator door has plenty of space for rent. There are times when I look fear in the eye and march forward bravely and platitude-free into the unknown … like now, I hope. I’m presently preparing to move my body and my life 500 miles north to Marin, Calif., to take the next step with my beloved. That step isn’t marriage, mind you, or even living together. It’s being neighbors. Sharing the same zip code. You see, I’m a big fan of proceeding slowly and wisely in relationships … taking small, steady steps, gently dealing with the fears that arise along the way. Some miniscule fears have been coming up for me lately — like suffocating, losing my sense of self and having to relinquish my grip on the remote control. My girlfriend, who gives me all the space in the world, has been very understanding. She, too, has had her terrifying contractions of claustrophobia in this relationship. She knows that periods of processing are purifying precursors to powerful, positive changes. On a few occasions, I’ve trembled in her supportive presence and thoroughly unloaded my worst-case scenarios and dramatic “what if” fantasies. She offered hugs, kisses, empathy, compassionate listening and some wise words. She’s a keeper. A relationship is quite a ride. As a child, I used to love rides. What happened? A few years ago, I went to an amusement park with some friends. They coaxed me (post-adolescent peer pressure) to get on a ride that challenged both my fear of heights and my biological ability to retain ownership of the contents of my stomach. I believe the technical term is “throw-up ride.” A bunch of young kids were on it too, and as the ride went up, way up, they were laughing, screaming and having great fun. I wasn’t. My belly knotted in protest, and I was dizzy with fear. 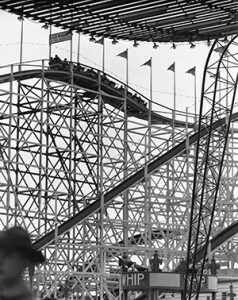 Suddenly, the ride went straight down. Fast. I spent the time hating every moment and wondering why anyone would pay money for an experience like this. I noticed that the kids screamed all the way down, totally loving it. What had I missed? What did they know that I wasn’t getting? Last month I found out. My girlfriend convinced me to ride a roller coaster with her. I said yes mostly out of desire to project a fearless (macho) self-image. It was only after sitting down in the front car and looking up that I realized I had made a big mistake. The safety bar locked into place, but somehow I did not feel safe. We started going up at a snail’s pace, agonizingly slowly. My knees began shaking. Panic gripped me. What had I gotten myself into? Damn my codependency and macho tendencies! There was no turning back, and I was dreading it. I started making strange and interesting sounds at the very top of my lungs. I threw a primal tantrum and held nothing back. Very quickly, my fear transmuted to a tingling excitement. Laughter bubbled up and out. My need to be on the ground (and in control) dissolved into trust and exhilaration. Whee! I loved it so much, I wanted to ride again. Perhaps the presence of fear can be a sign that we are courageously buying a ticket to the roller coaster of change, saying yes to the ride’s ups and downs and not paying allegiance to our ego’s plan to keep us small, safe, secure and unchallenged. Perhaps fear plays an accompanying role in any choice for greater aliveness, passion and healing. And, perhaps, it would behoove us to rediscover that childlike ability to accept and enjoy fear … deeply breathing, tingling, trembling and, yes, screaming at times. “The only thing we have to fear is fear itself.” I would take it a step further. We have nothing to fear. Not even fear. Enjoying ourselves while trembling is a wondrous step in the evolution of becoming free of fear. I feel a passion to move, and to keep on moving. I’ve been around long enough to know that staying in one place is not only undesirable, but downright impossible. We are always moving, changing and growing. Riding the roller coaster is what we signed up for on this planet. It’s non-negotiable. The more we say yes to the ride, the more we enjoy ourselves. I wish you great delight in the amusement park. Enjoy the fear. Give yourself permission to scream. Have fun! Scott Kalechstein is a modern day troubadour and inspirational speaker. He travels through the United States, Canada and Europe giving concerts, talks and workshops, as well as presenting at conferences. www.scottsongs.com, scott@scottsongs.com.